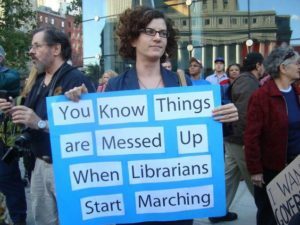 Libraries are their own worst enemies: they continue to support profiteers while hiding the true cost of publishing from their own users. We all know the story, we pay the academics to write the papers they give for free to the publishers who charge us to read them. That’s not wrong, per se, but for the huge profits the publishers make. The profit from the largest academic publisher would fund all of New Zealand’s research 675 times over. In my view, that profit is government money that is given as a subsidy straight into shareholder’s pockets. I would prefer that money went into research, and that the optimal business model for publishing research is a non-profit one. We can argue about that some other time, but I hold that the superprofits made by academic publishers are profiteering. Libraries are good corporate citizens. They obey the rules until they don’t, and then it’s with very clear and sophisticated reasons. Source Unknown. Would love to know. Libraries have very successfully hidden the questionable practices of publishers by acquiescing to their demands. Tell an academic how much their institution pays for digital access to stuff they wrote and gave away for free and I promise you, they’ll blanch. then say, you could have that money back for research, if you give me 10% to keep the publishing system going with non-profit publishers, and they’ll sign. (There’s always a few nay sayers, but being a stirrer is part of the job description, and I love them for it). A recent article in The Idealis suggested that libraries should employ interns to assess what journals they should drop when the material is available as Open Access (Gonzales 2017). I say we should include what material is also available including those through piracy. Piracy is not fair, not legal and not ethical. Neither is profiteering, but we seem to be happy to support that. Just as importantly: neither profiteering nor piracy is sustainable. See how many of your users already use pirate sites to gather their research material – there are institutional logs for that, and you don’t have to identify anyone while you’re doing it. See that it is already having a big effect on access to information. Think about cutting down your subscriptions, and sending that money to OA initiatives that support the research done at your institution. Encourage overlay journals as an alternative to peer-review. (There isn’t too much research, there are too many papers). Break up the big deals, so that the small journals need to flip to OA or die. Keep looking at the amount of piracy done by your institution, and use it as an index of how effective the change of model is, because when legitimate access becomes convenient, piracy will die. Prev Are the expectations for data management plans too high? Next Never pay for primary research.